So pleased that there will be an exhibition of work from my Inferno for Thornwillow will be on display at my alma mater Sarah Lawrence beginning March 19 and going through May 20. More details HERE. I hope you will enjoy the final run-up to the publication of “Inferno” featuring a letterpress edition of my hand-lettered and fully illuminated/illustrated original artwork. For more on the project check out the video below. Thornwillow is raising funds for INFERNO on Kickstarter! A modern take on Dante's masterpiece: Hand-lettered, beautifully illustrated, printed letterpress, and hand-bound. Brooklyn, NY, July 26, 2017 – Studio 153 / Coffey Street is pleased to announce an exhibition of new works by George Cochrane entitled Hades High. The exhibition locates Dante Alighieri’s poetical work firmly in today’s world, connecting our present-day reality to the poet’s timeless observations on human behavior. This is the inaugural exhibition at Coffey Street and is on view October 8 through November 5, 2017. An opening reception will be held on Sunday, October 8, 4-8pm. The exhibition takes its title from the seventh, most recent chapter of Cochrane’s graphic novel currently in progress, Long Time Gone. The autobiographical work, created in collaboration with the artist’s daughter Fiamma, and modeled on Homer’s Odyssey and James Joyce’s Ulysses, tells the story of a single day in Brooklyn. The novel unfolds across twenty-four chapters, mirroring the Odyssey’s twenty-four books, and jumps between George and Fiamma’s day. In Hades High, George encounters Dante as he guides him though a re-visitation of high school, forcing Cochrane to confront a troubled past while revealing his own artistic origin story. In large-scale paintings and drawings, Cochrane depicts Dante as a character in our world today, placing him in and around New York City at art fairs, rallies, and in banal scenarios, such as waiting for a bus or standing by the Gowanus Canal. Cochrane’s expressionistic brushwork and non-local color dematerialize the painted forms of the figure and his environments, intermingling both figure and ground, as well as the historical and the contemporary. The drawings, made since Trump took office, show Dante lurking at an anti-Trump rally, trolling Trump Tower, or observing Trump being devoured by Satan in the ninth circle of Hell. Drawn in silverpoint, ink, and colored pencil, Cochrane’s artist books explore these themes in a more intimate format. Responding to Cochrane’s Hades High, publisher Luke Ives Pontifell of Thornwillow Press invited Cochrane to make a new illuminated manuscript of the Divine Comedy to celebrate the 750th anniversary of the poet’s birth in 2015. Studio 153 presents original artwork from the first volume, Inferno, with copies of the newly published book. In creating his contemporary illuminated manuscript, the artist uses hand lettered comic font and comic book visual tropes to invigorate the artistic and illustrative history of the Commedia. Studio 153’s exhibition will be the first New York presentation of Long Time Gone, which debuted at MASS MoCA in North Adams, Massachusetts, and was subsequently exhibited at the Tweed Museum in Duluth, Minnesota. Hades High is the inaugural exhibition for Coffey Street, a new space for contemporary art and performance in Red Hook, Brooklyn. In conjunction with George Cochrane: Hades High, Studio 153 will present a series of curated programming on topics ranging from comic books and the history of art and protest, to problems of translation and textural transmission in the manuscript tradition. STUDIO 153 is an artist-led venture, dedicated to the exploration of new work. The creative team specializes in theater, photography, visual art, and film. The curated program will maintain individual disciplines, but engage in a deeper investigation of art making through a collaborative, multi-disciplinary approach. The studio was co-founded in 2016 by theatrical designer Andromache Chalfant and longtime friend and frequent collaborator, M. Sharkey, a photographer and filmmaker. The studio is located in a 13k square foot warehouse on Coffey Street in Red Hook, Brooklyn. Excited to celebrate Dante Alighieri's 750th birthday and talk with my colleagues and friends about why he still matters today. Tuesday, April 7, at 2PM at Fairleigh Dickinson University, Florham. In January 2015, George became the first “artist-in-residence” at Thornwillow Press in Newburgh, NY. 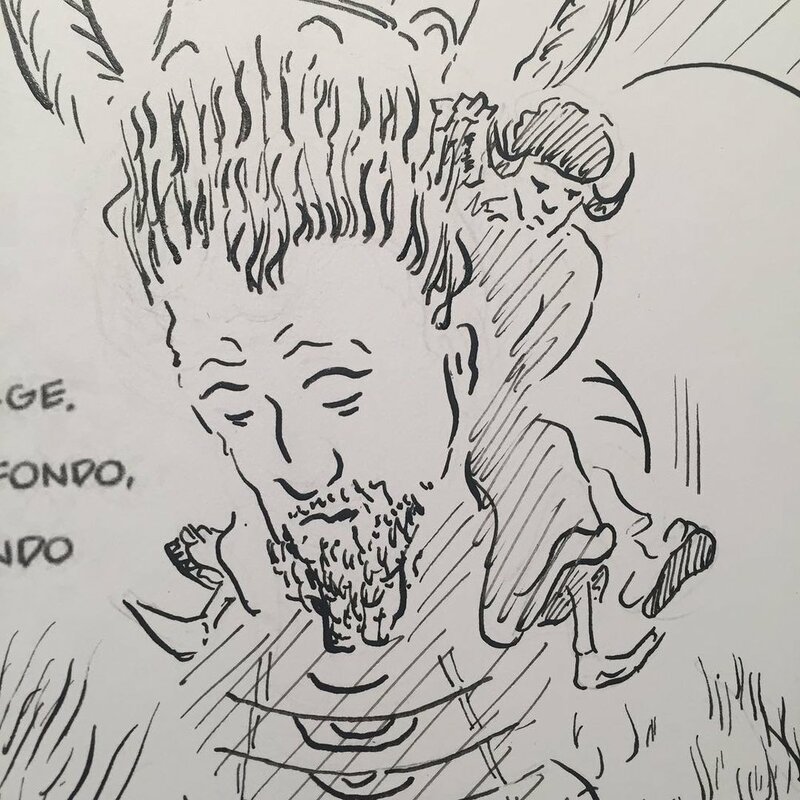 There, he is producing his 24 chapter graphic novel in-progress, Long Time Gone, over the next five years for Open Corner. The first seven chapters, along with fine art prints created at Thornwillow, will be presented at the MoMA/P.S.1 NY Artist Book Fair in September, 2015. 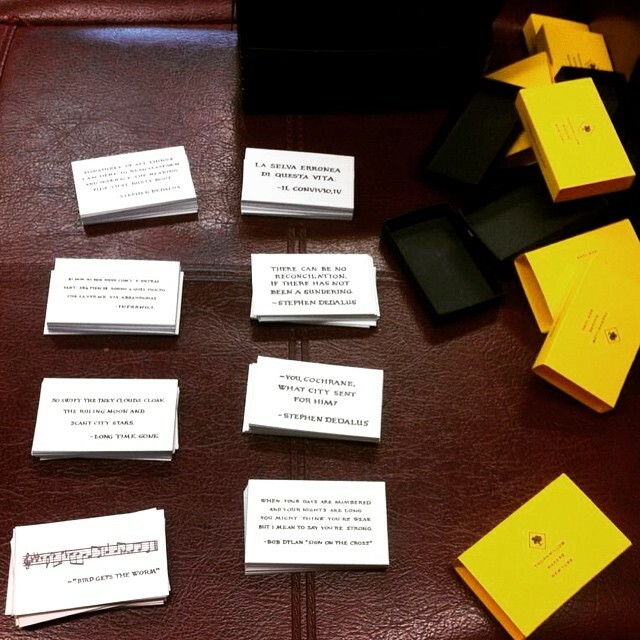 The first piece of Long Time Gone material created at Thornwillow Press, is a set of hand-lettered quotes connected to the graphic novel, housed in a matchbox. To celebrate Thornwillow Press’s 30 years of fine book-making, Cochrane is also at work on The Newburgh Commedia, marking the 750th anniversary of Dante Alighieri’s birth. 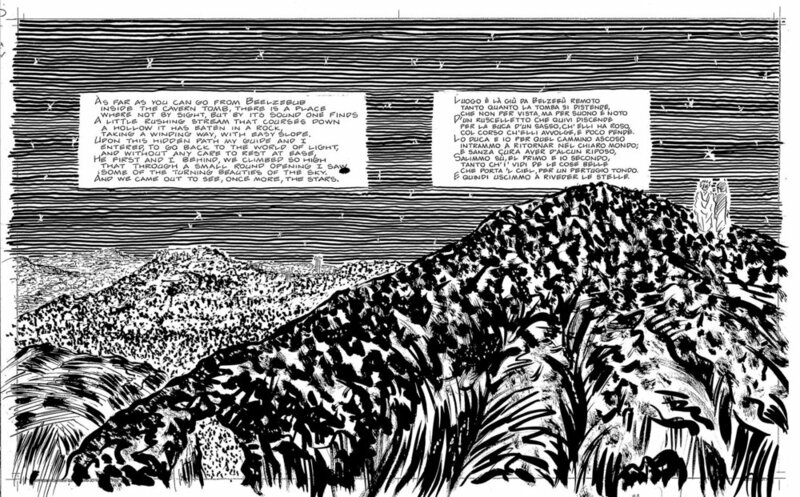 The project consists of the creation of a new manuscript version of Dante’s Divine Comedy, to be published and presented with images connecting his timeless poem to city of Newburgh. Cochrane is modeling the presentation of his comic-lettered text on the earliest known manuscript as well as early printed, illustrated editions of Dante’s masterwork. Cochrane’s images trace a line from early illuminated manuscripts and printed editions of the Commedia, through the history of art, and to the worlds of the comic and cartooning arts. Additional to the limited edition volumes of the The Newburgh Commedia, Cochrane is producing limited editions of Fine Art prints, and more, which will culminate in an exhibition of the artworks in Newburgh and also a presentation at MoMA/P.S.1 NY Artist Book Fair in September, 2015.